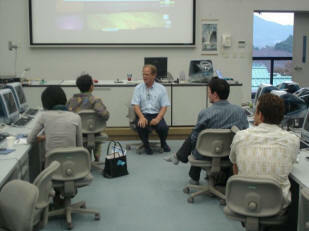 This workshop, held in conjunction with JALTCALL, featured three 45-minute hands on presentations and an electronic poster session. In the main presentations, Paul Daniels & Timothy Gutierrez – Delivering Digital Content through Moodle, showed how an open-source content management system can be utilized to support in-class language learning activities. Lawrie Hunter presented on Effective PowerPoint presentations, guiding his audience through techniques for effective use of PowerPoint in the language classroom. Hunter suggested useful tips for the design, content and use of this software. Davey Leslie, in his presentation, The website as narrative: scripting a site with a notepad and a cup of coffee, shared ideas for creating unique sites based on his experience as a professional website developer and language teacher. 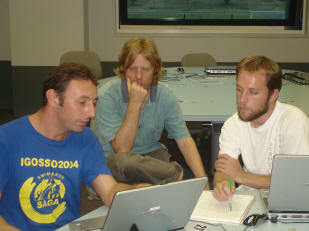 In the poster session’s unique digital format, presenters were assigned a table with four notebook PCs with Internet access, digital video and still cameras. Presenters demonstrated digital course content, useful websites, student projects, and educational lessons, giving their audience hands-on time with their software and content. Posters were presented by Marcus Otlowski– Online learning sites, Sean Burgoine – Using mobile phones/digital cameras for storytelling, Michael Sharpe – Mobile blogs, Charlie Robertson – Use of video storyboarding, Paul Daniels and Tim Gutierrez – Moodle: Classroom Use, and Ian Isemonger– An online-refereed journal for students. Sunday, October 22, 2006, 3:00 to 5:00 PM. The free content management software called Moodle is looking to be the state of the art for some time to come in CALL. Learn how this easy-to-use system can put you in the IT driver’s seat. but be able to move around and use the activities found on them. Kochi University for their simplicity and usefulness. Participants will be able to access these websites and explore the online learning environment. Using mobile phones/digital cameras for storytelling. To make storytelling more structured for the narrator and more vivid for the listener, a series of still images can be used. By recreating a story and taking pictures at certain intervals, an aid that can compensate for linguistic limitations can be made. The necessary technology, being a personal computer and digital camera, should be at every students disposal. mobile phones to create mobile blogs or MoBlogs about their daily lifestyles. This poster presentation will demonstrate the use of Video Storyboarding as a creative means to narrative development based on sound grammar and logical thinking. how Moodle’s activities can be utilized to support in-class language learning activities.